Can you believe it? A new year and the first monthly Greater Atlanta Coin Show is already over and gone. Thank you to one and all that came to the early January show. We had a good group of visitors, though not quite as busy as the pre-holiday shows. And, did you notice? The hotel was not as busy either - no holiday parties with the hallways packed with people. Of course, we cannot forget, our appreciation goes to all the dealers that packed the bourse with their showcases of numismatics and other collectibles, thank you to our security and thank you to the hotel's personnel. The weather for this show was cooler than the "heat wave" we had during the holidays, yet it wasn't as cold as it could have been with the "polar vortex" hitting the middle of the country. Instead, we had some sun and some clouds with temperatures rising into the low 50s. In other words, a relatively nice day for early January. If you're wondering why the January show is so early in the month, many of our dealers go to the large F.U.N. coin show scheduled for the 7th through the 10th. F.U.N. stands for Florida United Numismatists, and they always have a large show in January, usually in Orlando, but this year's January show is in Tampa. Several of our dealers talked about their plans for the show. Some go early for dealer-to-dealer business and to enjoy the warmer Florida temperatures. Others make plans for during the show and the treasures they specifically hope to find there. As for the Greater Atlanta Coin Show's bourse this month, let's take a virtual look at some of the numismatics and other collectibles seen on the bourse. First, let's view a flying eagle cent struck in 1857 (159 years old) and certified by PCGS as MS62. Shows an attractive high quality of mirror (or other style Proof) surface and strike for the date and mint. A few small scattered contact marks in groups, or two larger marks, may be present, and hairlines may show under magnification. Noticeable light scuff marks may show on the high points of the design. Overall quality is above average and overall eye appeal is very pleasing. If copper, the coin has full luster with original or darkened color as designated. A few spots may be present, but they do not greatly detract from the eye appeal. The coin's "red" designation applies to the color. Many copper coins turn brown. This one has maintained its reddish hue. The US Mint produced the flying eagle cents from 1856 through 1858 at only their Philadelphia location. In 1857, the Philadelphia Mint struck just under 17.5 million of the coins. An impaired or dull luster may be evident. Clusters of small marks may be present throughout with a few large marks or nicks in prime focal areas. Hairlines may be very noticeable. Large unattractive scuff marks might be seen on major features. The strike, rim and planchet quality may be noticeably below average. Overall eye appeal is below average. If copper, the coin will show a diminished color and tone. Still, though, a coin of this age in MS-62 grade is a very nice specimen and commands a value in the three digit range. Next on the bourse was another flying eagle cent from 1858. In that year, the Mint produced 24.6 million of the coins, but their results included three varieties: large letters, 8/7 and small letters. The coin at the show was a large letter variety certified by NGC as MS64. A year younger than the first and in a better grade, this coin commands a higher value into the four digits. Staying with the one-cent coins, the next coin, an Indian Head from 1877, had a small, relatively speaking, mintage of 852,500 at Philadelphia. This coin, though nice and in a certified holder as MS60, had additional "details." In this case, the grading company identified the coin as "cleaned," which decreased its value even though it was a pretty coin. However, the 1877 is a key date coin, and a "cleaned" MS-60 version still has significant value in the four-digit range. Produced one year later, the next coin on the bourse is another Indian Head cent. This 1878 coin struck in Philadelphia was certified by NGC as a Proof 65 red cameo. For that year, the Mint made just 2350 proof coins. The other description, "cameo," describes the contrast between the mirror-like proof quality of the field versus the satin quality of the device or design. In summary, this Indian Head cent was a beautiful 138-year-old proof coin in almost perfect condition. Next on our list, a 1967 quarter coin with triple clips was on display at the show. Coin errors are rare, but not as rare as the US Mint would like them to be. Several collectors like to find and identify the errors. And, an error on an otherwise circulated, commonly available coin can make that coin worth more than the value of similar coins - it depends on the error and its desirability. This coin's planchet in its travels through the minting process became clipped not once, not twice, but three times - and after being struck as a quarter coin, made it out of the Mint's quality checkpoints. Let's move to some dollar coins on our tour. The Philadelphia Mint produced almost seven million of the 1901 Morgan dollar coins, and the Red Book cautions, "Authentication is recommended. Beware of altered mintmark." Our example had been certified by NGC to be AU-58. The barest trace of wear may be seen on one or more of the high points of the design. No major detracting contact marks will be present and the coin will have attractive eye appeal and nearly full luster, often with the appearance of a higher grade. This coin ranges from simple double digit values in the low grades to healthy six-digit values in the high grades. Moving along to the last year of the circulating silver dollars, the next coin is a peace dollar. The San Francisco Mint struck just under two million of these coins including this one certified by PCGS as MS-65. The Red Book notes for this coin, year and mint, "Varieties exist with either three or four rays below the ONE and are of equal value." Even being the new kid on the block in our list of coins, the 1935S MS-65 Peace Dollar coin can command values into the four-digit range. Now, last on our tour for this month is another collectible altogether, but many collectors have varied interests. This example appeals to the collectors interested in Coca-Cola or local memorabilia. Did you know that Coca-Cola introduced an elf-like cartoon figure in the early 1940s into their marketing campaign? This figure became known as "Sprite-Boy" and could be seen with either a bottle cap or a soda jerk's hat on his head. 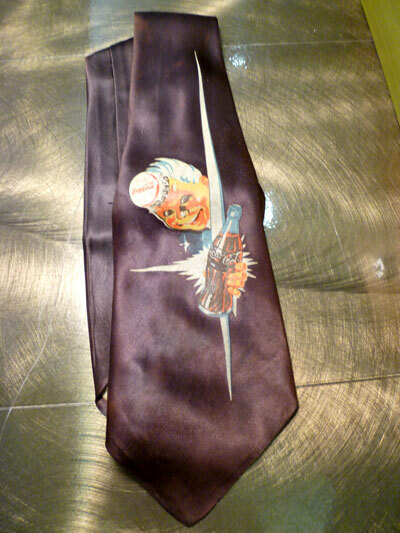 Take a look at this men's tie with Sprite-Boy promoting a bottle of Coca-Cola. Their site claims he came much earlier than their Sprite product and was long gone before the Sprite drink was introduced. Though they say there's no relation, one still wonders if the name Sprite didn't have some correlation to their earlier marketing. That's it for the tour this month. By next month, the dealers will have attended several multi-day coin shows. Plan on visiting to see what interesting numismatics and collectibles they add to their displays in February. Mark your calendars for the next Greater Atlanta Coin Show on Sunday, February 14, 2016 in the Joe Mack Wilson Ballroom.